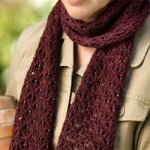 Yarn: 300 yds dk or 230 yds lace weight mohair New lace knitters will enjoy this simple but lovely stitch pattern. A four+four-row repeat and easy-to-see centered stitch alignments make this the perfect pattern for learning to ‘read’ your knitting. 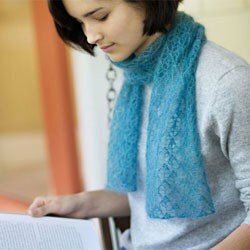 It’s a relaxing and satisfying knit for accomplished lace knitters, too. A little beading gilds the lily.